A common grammar/usage error is faulty subject-verb agreement. This and the previous lesson offer some guidelines for avoiding this problem. The girl laughs at the clever clown. They often go to the movies. The rule doesn’t change when this happens, it just makes finding the subject a little trickier. 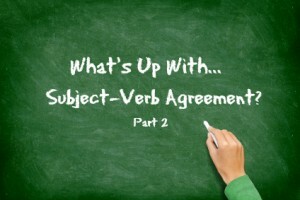 Sometimes a series of clauses and/or phrases can separate the verb from its subject. Be sure you can identify the subject to avoid any errors here. In the following example, notice the distance between the subject (companions) and the verb (emerge). My favorite companions, including William Evans, whose smile and quick wit make him a favorite wherever he goes, and Eddie Burton, who is shy in public, but gregarious and clever when among friends, suddenly emerge from the limousine. In sentences like this, by the time you get to the verb, it can be hard to remember what subject you started with. Be sure your verb agrees with the correct word. In particular, watch out for prepositional phrases beginning with of. These tend to cause problems because the object of the preposition can appear to be the subject, as in the sentence below. One of the doctors has called. A simple rule that can help you here is this: The subject of a verb can never be part of a prepositional phrase. Below are two examples where it might be easy to confuse the object of the preposition (in blue) with the actual subject (underlined). Notice that the verbs agree with the underlined subject, not the noun in the prepositional phrase (in parentheses). The captain [of the cheerleaders] is Gretchen. The members [of the organization] are planning a parade. Don’t be confused by sentences with phrases and/or clauses between the subject and the verb. 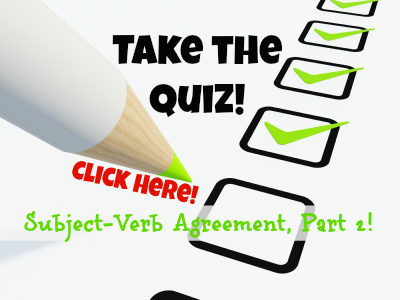 Be sure you correctly identify the subject and make the verb agree with it. My friends and I are going camping. Either Edna or her sisters are joining us for a picnic. When the word “and” combines the parts of the subject, the verb is always plural, and requires a plural verb. Steve and Chuck drive to work together. When the word “or” or “nor” combines the parts of the subject, the verb should agree with the subject part that is nearest to it. Neither the musicians nor the conductor is ready for the performance. When and combines the parts of the subject, think of it as a plus sign. One subject plus another gives you more than one subject; therefore, the subject is plural. It’s a bit trickier when or or nor is used, but it normally feels natural to make the verb agree with the subject part that is closest. Indefinite pronouns are often hard to identify as singular or plural. Many of them seem to be plural but are actually singular. That’s why it is correct to say Everybody loves pizza, instead of Everybody love pizza. Examples:Everybody likes ice cream!One does not put elbows on the table.Each receives an allowance. Examples:Both come with instructions.Many are poorly fed. Notice that all the indefinite pronouns that end in –body, –one, or –thing are always singular, and that only a handful are always plural. Keep this in mind to avoid making agreement errors. All of the money is locked up. None of the water is drinkable. None of the players are eligible. With these pronouns, the trick is to look at the prepositional phrase that comes after it. If the object of the preposition of is singular, the verb will be singular (like money and water above). If the object of the preposition is plural (like friends and players), the verb will be plural. This concludes our look at subject-verb agreement. As you write, learn to recognize the five kinds of sentences that cause trouble, and double-check every verb to be sure it agrees with its subject. Think you get the idea? Take the quiz and find out! I am m8. I was appreciating the work this man does. Thank you for a great and informative post! This is one I am printing out to keep handy while writing. That’s great to hear, Christina. Let me know how it prints. I could probably create a printable version of this for download if that would be convenient.